Mediacaster Magazine talks about how My Babysitter's a Vampire has earned a second season and how successful season 1 online game, Humans vs. Vampires, is on the Teletoon website. 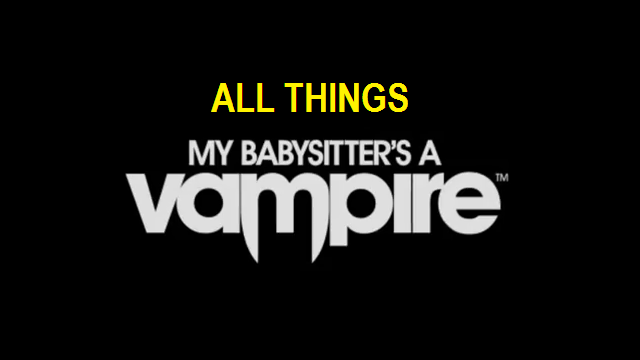 A second season of My Babysitter’s a Vampire is currently in post-production for the Teletoon specialty channel, and it’s already been acquired by Disney Channel and Disney XD. The TV show has a huge online following, and its audience has tallied over four million page views on teletoon.com and the show’s online companion game. Called Humans VS Vampires, the game uses stereoscopic 3D technology and features photorealistic game avatars, modeled from videos of the actual TV series actors. Players can switch from stereoscopic 3D back to 2D instantly as they play the game. Computer keyboard commands control the actoin, and characters have special moves to use in battle. Multiplayer functionality is included and players can send invite codes to their friends by IM, text or email to play live remotely. Based on the Movie of the Week directed by Bruce McDonald, the show is a special effects, live-action comedy for 'tweens, spoofing retro horror movies and the Twilight series, and Teletoon’s first live-action property. Online, points scored in the game helped determine the final episode outcome of Season 1 of My Babysitter’s A Vampire, which aired on the specialty channel. Although Season 1 has wrapped in Canada, the game continues online and on popular game site Kongregate. Humans VS Vampires was co-produced by Secret Location and Fresh TV and funded by the Bell Broadcast and New Media Fund. Humans VS Vampires is Secret Location’s first large-scale, stereoscopic 3D game. “Humans VS Vampires has been a resounding success with our audience. By combining an addictive game mechanic, exceptional graphics and the ability to play as their favourite MBV character, Secret Location has set the bar for transmedia properties on teletoon.com,” said Gavin Friesen, Director, Interactive, Teletoon Canada Inc.
Secret Location is an interactive based in Toronto, ON, led by President/Executive Producer James Milward. Fresh TV is an award winning multi-media company based in Toronto. Founded by Tom McGillis, Jennifer Pertsch, George Elliott and Brian Irving, the company TV finances, develops and produces animated and live-action programming. Fresh TV also operates animation studio Elliott Animation, which provides a full range of 2D, 3D-CGI and 2D Flash animation production services for major North American clients from its studios in Toronto and Hamilton. Alice Prodanou Wins for "Re-Vamped"